We will answer any of your questions about your care every step of the way. Being in an auto accident isn’t only frightening, but it results in long-term ligamentous damage. Your connective tissue is like Saran™ wrap. You can stretch it back out to almost exactly where it was, but it will never be the same. Once a tendon is stretched and pulled it’s never quite the same, unlike a broken bone which heals. When someone sustains whiplash, there’s been connective tissue damage, so mobilization is the key thing after an accident. Healing will start to take place immediately; however, whether you heal correctly or incorrectly is the issue. Just as a birth is hard on a newborn’s cervical spine, an auto accident is tough on the body. With a car wreck, it’s all about the trauma. It doesn’t matter if the crash involved two vehicles, you getting hit by a dog and get knocked over, or you hitting your head on the garage door. It’s all like a motor accident to Dr. Gregg, who will want to check for subluxation. As not everyone will experience whiplash during a car wreck, Dr. Gregg will determine if you’ve sustained a sprain or a strain or a subluxation, or if there’s been trauma to the connective tissues. He’s had great success helping patients find relief following an accident and get on the road to healing. It’s his desire to help you too. If you are a new patient, please allow 45-60 minutes for the exam. How Long Does It Take to Recover From an Auto Accident? 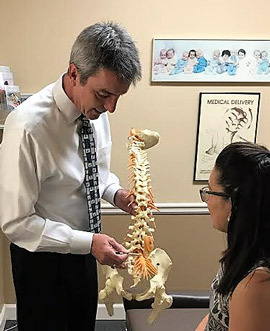 At North Marietta Chiropractic Center, we will have you come in for 12 visits. At the end of that period, Dr. Gregg will re-evaluate you. He’s looking for at least a 50% improvement. If, after 12-15 visits, you don’t see any progress, he’ll refer you out for an MRI or will send you to the physical therapy practice around the corner to ensure you get some relief. If you’ve been in an auto accident, it’s important that you get care right away. Contact us today to schedule an appointment!